Me, Myself and I: Xīn Nián Kuài Lè! Happy Chinese New Year everyone! Yesterday I was craving for a "tikoy"(Nian Gao or Chines New Year cake) and I think that craving didn't go away as I longingly look on the pictures on the web. How come the shops that sells good quality Chinese delicacies are far from my place? Ugh! 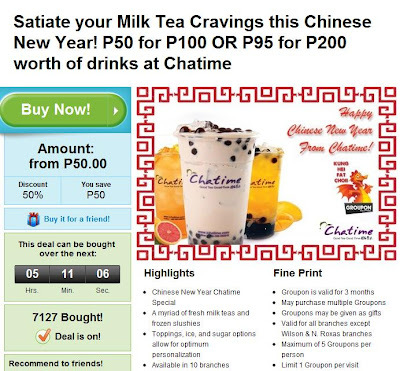 CHATIME was founded in Taiwan in 2005, and aims to be the most loved and respected tea company in the world. Since its founding in 2005, ChaTime has become one of the biggest international bubble tea brands today, as well as being the only publicly listed beverage provider in the Taiwan stock exchange. As of September 2010, we have over 480 stores worldwide in Taiwan, Malaysia, China, USA, Vietnam, Hong Kong, Indonesia, and Australia, plus new stores opening soon in Korea, Japan and the Philippines! Unlike other bubble tea stores, CHATIME tea is fresh and brewed on site with real tea leaves. Fresh tea is not only more aromatic, but also healthier. 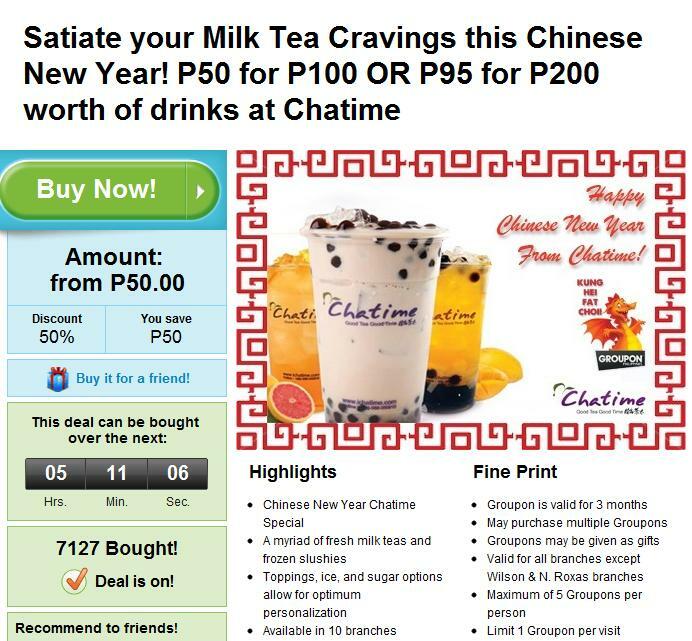 Together with this, we infuse different natural flavors to make CHATIME the best bubble tea drink store in town! I've taken a sip of Serenitea (Passion Fruit Iced Tea) and would love to try this one. I'm still dodging away from milk tea variants as I'm a lactose intolerant. So my best bet will be the fruit flavored drinks that they have. Hope I have the time to redeem the first coupon this week.